I awoke with my usual early morning vigour and jumped in the shower. The thing had another box on the wall, which made a hell of a noise. Turns out it had a pump inside to give extra power, and it was certainly a powerful jet. Michael and his Mum were still setting out breakfast so I went for a brisk constitutional around McCraigs tower. A rabbit ignored me as it vandalised the gardens. I was intrigued to notice the walls of the tower were leeching some sort of mineral that was causing stalactites. Makes for a lovely effect, well over a hundred years of rain had caused some quite big ones on the higher arches. Another good Scottish breakfast set me up for the day. Man, these Scots like a good breakfast. Owner Michael was telling me that he was closing at the end of the season for the winter, and had a winter job lined up in Malaga. 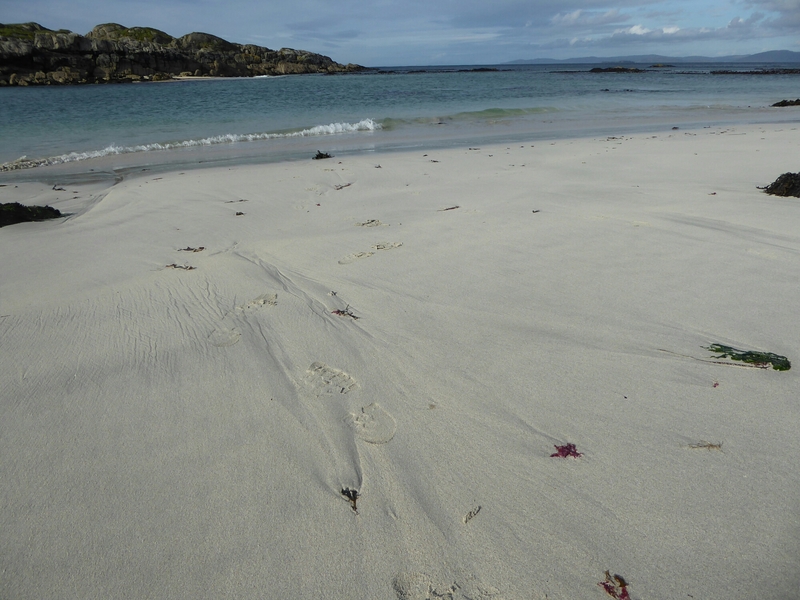 I was feeling adventurous, for that night I was going to sleep on Iona. Now, Iona is a mystical island. 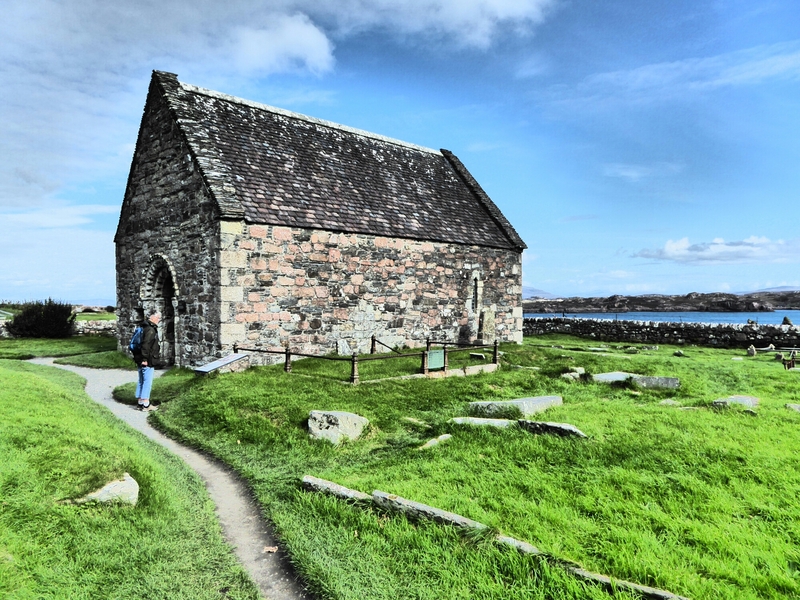 It’s where St Columba settled in the sixth century, bringing Christianity to Britain. The island flourished in the centuries after his death as a place of learning, from where monks traveled all over the known world to collect knowledge. For three hundred years, until the Vikings took over, it was the focal point for culture and manuscripts. Intrigued due to my interest in medievalia, I was determined to visit. And stay the night. 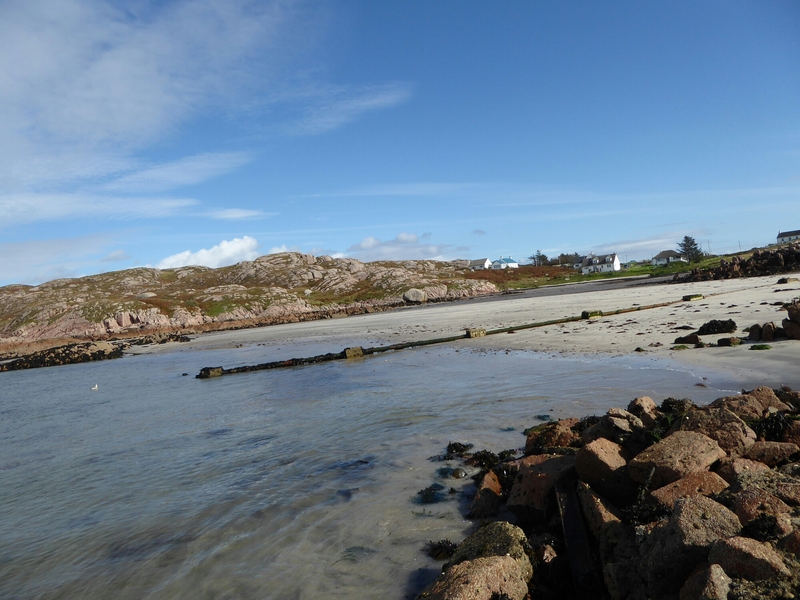 Now, Iona today doesn’t allow visitors to bring cars so I would have to travel to the village of Fionnphort on Mull and abandon the car somewhere, taking a short ferry journey on foot to the tiny island. 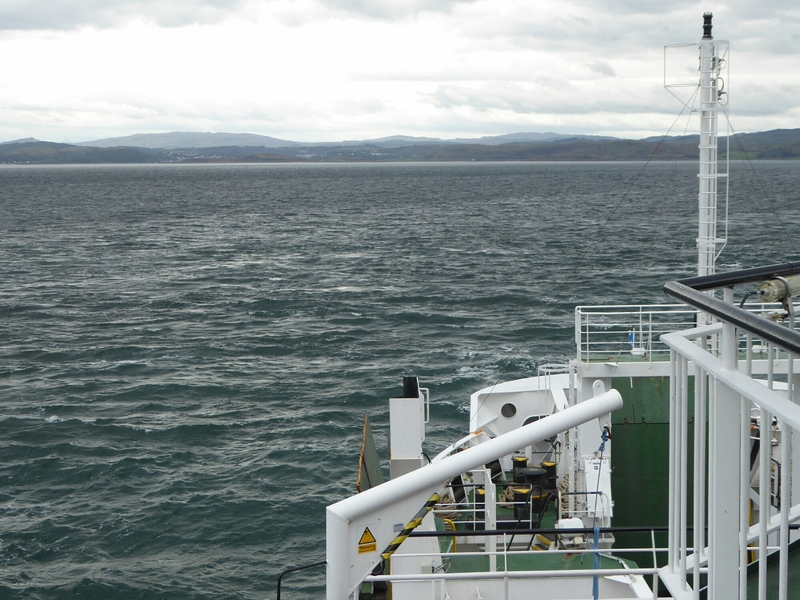 My first inkling of what Iona would be like was on the Oban – Mull ferry, traveling across the cold straits. I was on the upper outer deck, having barged my way into a pleasant sheltered corner. Next to me were two overly clean German backpackers, struggling to understand their brand new os map. I did my best to explain, and noticed they were looking at the Iona map. I asked them if they were going there and they enthusiastically agreed they were, to which I added so was I. As I fastidiously removed her hand from my arm, I said that sadly, no, the word of Jesus hadn’t yet reached me. Blocked out by constant BBC radio 2 in the car, probably. They shook their heads, more in sorrow than anger, but didn’t press the matter, and a passing gust of wind nearly blew their map into the Atlantic, which distracted them and allowed me to escape inside for a hot chocolate. You arrive on Mull at the dump of Craignure, which has little to recommend it, especially in the cold. You can see an old castle on your way in. Tour buses jostled in the car park in front of it. Mull seems quite a touristy place, having easy access from Oban. I sped off in the fiat, noticing my German friends trudging off towards the bus stop. A decent Christian would have offered them a lift, but I couldn’t be arsed. Hitchhikers cramp my style, and anyway I’d read there was a regular bus service. Mull is a big island. 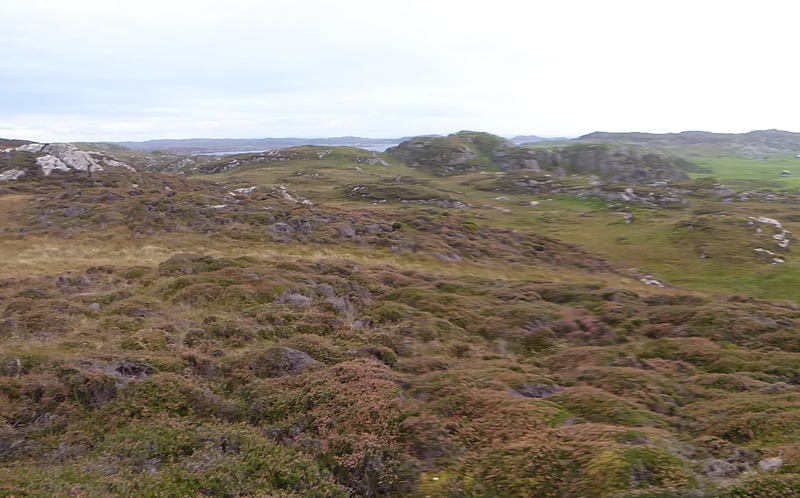 The road to Fionnphort is a windy single track that takes an hour to get there. Through stunning scenery, once you’re away from Craignure. 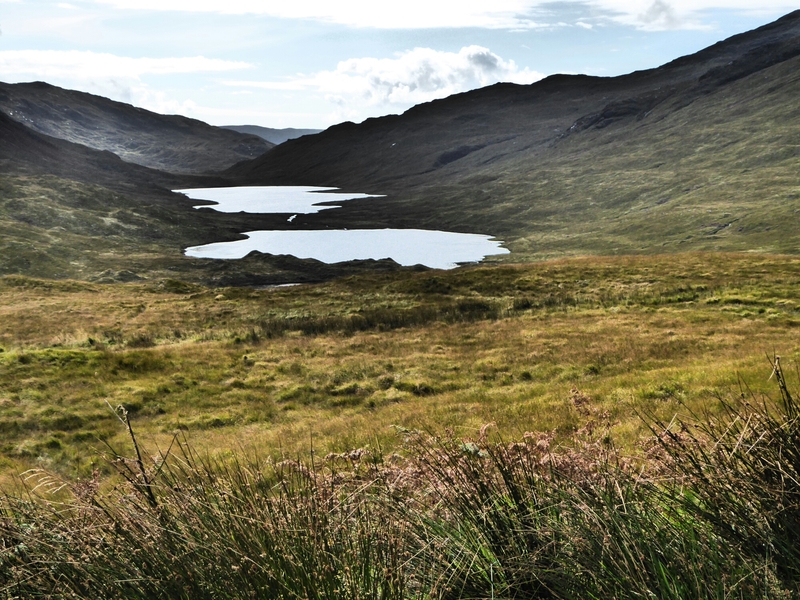 You’re driving through valleys between high hills, with lakes and glens on either side. 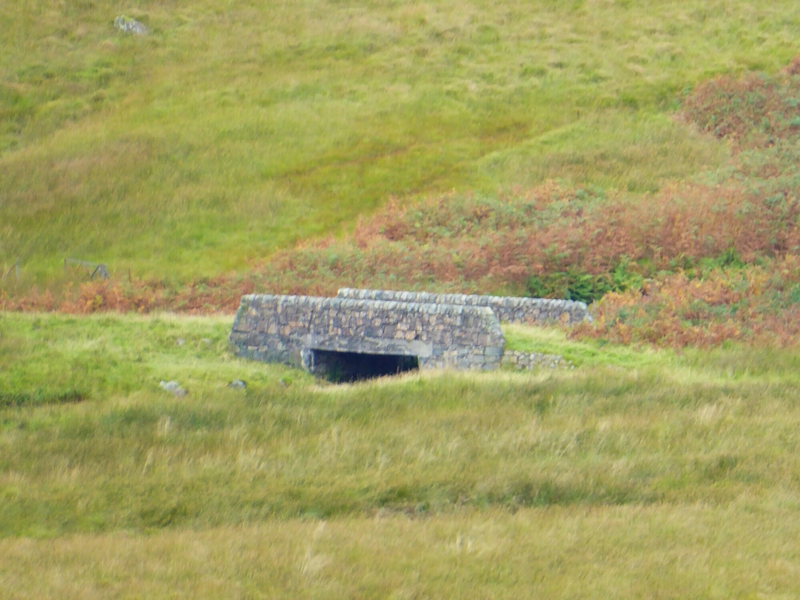 Mind you, the old road looked even worse, judging from the occasional abandoned bridge you could see amongst the heather. I arrived in Fionnphort, a place with little to recommend it apart from a massive free car park round the back. It’s well hidden – the canny locals try to guide you to the pay and display next to the ferry port. I abandoned the fiat to its fate, grabbing my rucksack with a whistle. 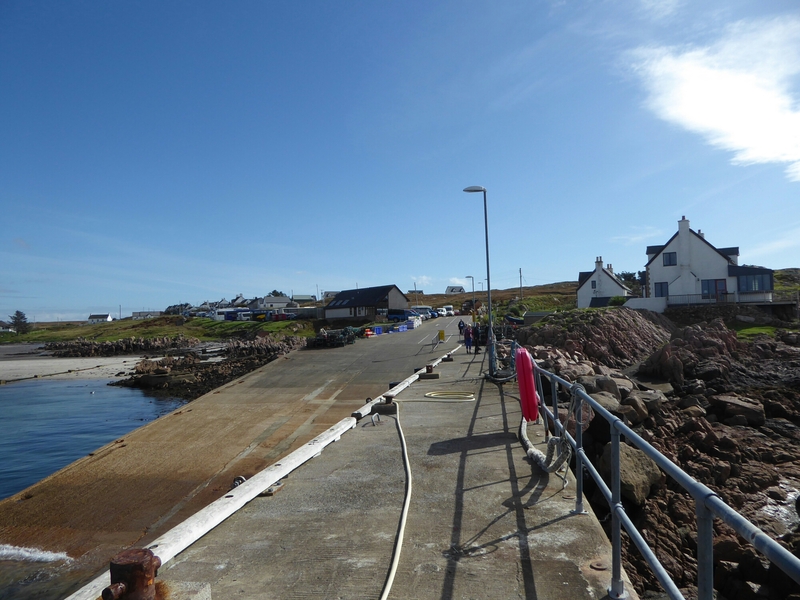 The place is basically a service point to keep tourists busy until the Iona ferry arrives. Couple of tourist shops, a crab shack, post office and the Calmac ferry jetty. And quite a few homes for sale. Here’s a picture of it from the end of the quay. Naturally enough I’d just missed the ferry and had to wait half an hour for the next one. I grabbed a fresh crab salad from the crab shack. Nice, but a little too much crab shell for my liking. I then spent some time wondering what the big rusty pipe in the middle of the beach was pumping into the sea. 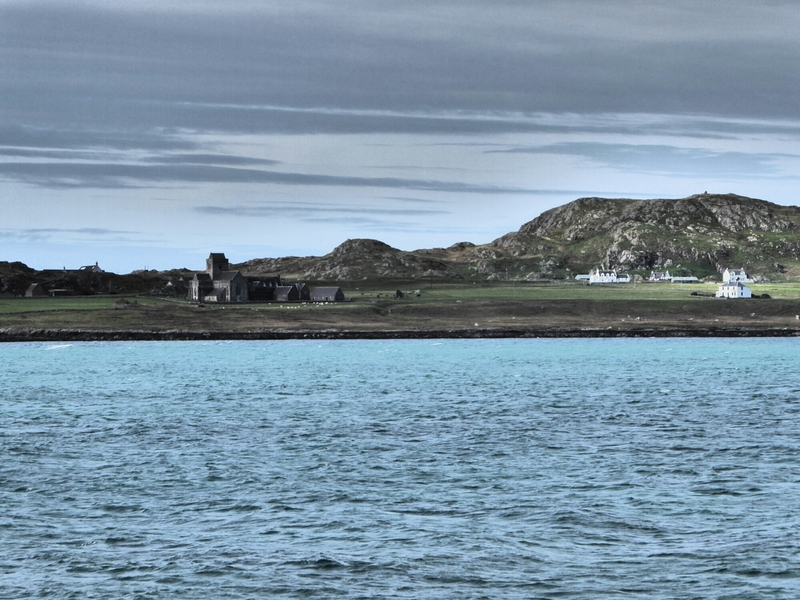 Iona sat like a glimmering jewel a mile across the sea. 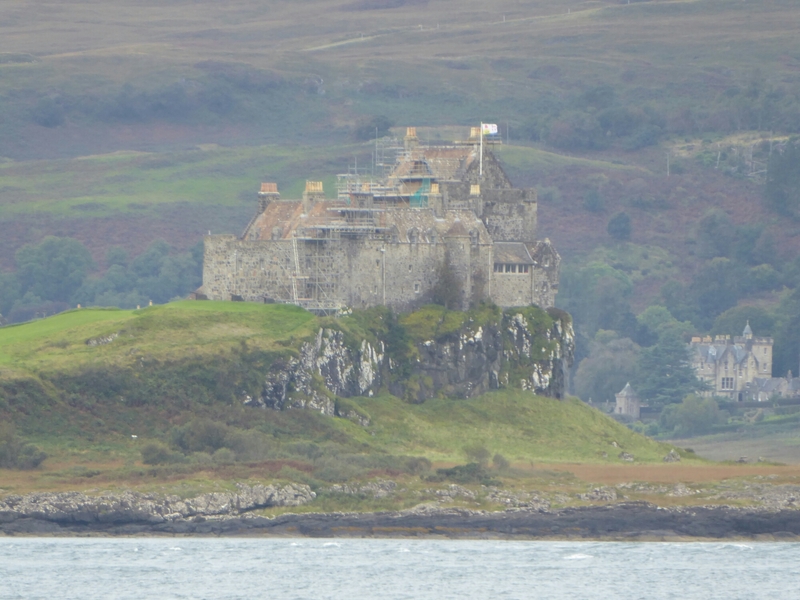 the abbey, which you can see in the photo, was a ruin until the duke of Argyll rebuilt it in the last century. He was later to give the island to the nation. He wasn’t especially religious, just spotted the tourist potential I suspect. The ferry came lumbering across the sea. I sat on the end of the jetty to watch it come. When I turned round, I was surprised to see a sizeable queue waiting, mainly from several tour buses that were disgorging their human contents. Lots of elderly and infirm yanks I noticed. I raced ahead of them and got into a good vantage point on the ferry. The ferry is basically a five car job with seats on the sides. A number of people in wheelchairs sat happily on the car deck. 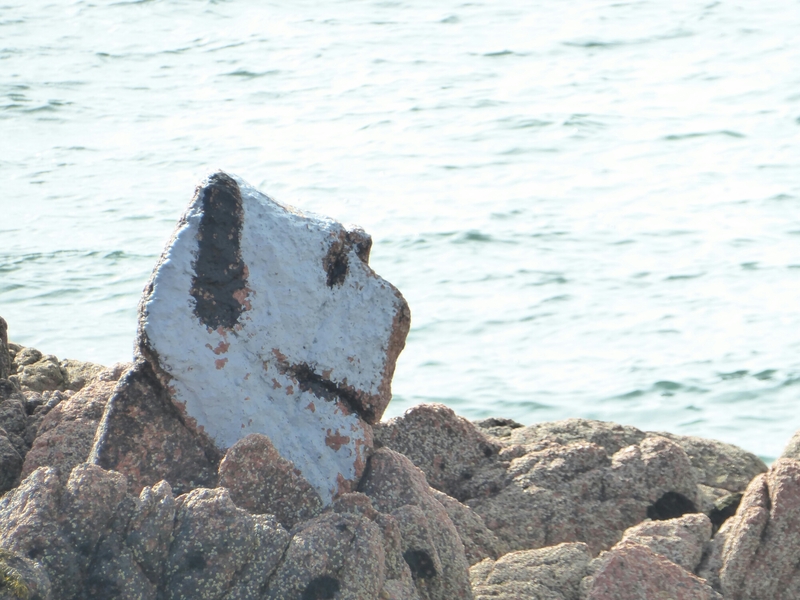 I noticed someone had painted a rock to look like a dog. We arrived in Iona. The settlement is known as martyrs bay, as a number of monks were massacred there over a thousand years ago by the Vikings. Names stick around here. The instructions to my guesthouse just said top of the pier – well, that just about described any of the homes there. 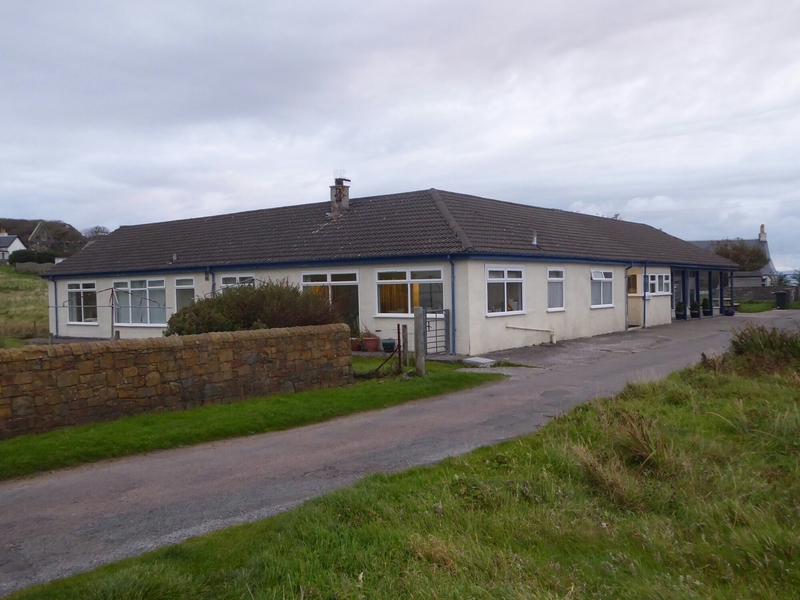 I found it eventually, a purpose built building with little charm. Damn hard beds, too. But clean and warm. Iona Is a compact little place. Most of the homes seem to double as b&b’s, but I’m told almost all the homes are owned by traditional islanders rather than being second homes. There are is only about a hundred people living there. It has two farms, two hotels, three restaurants, a post office, a fire station, a spar and the abbey. Do we need anything more? 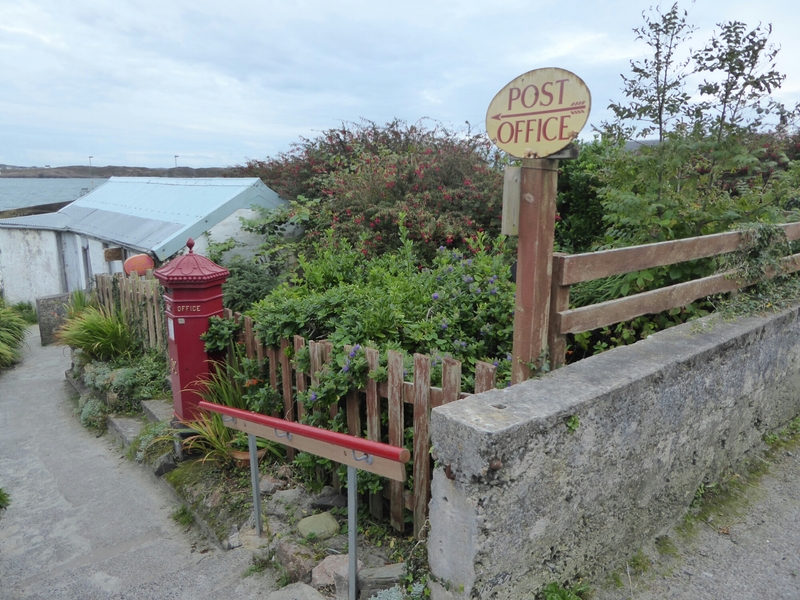 The post office, I was told by a proud local, is one of the smallest in the UK. I tried to get in but there was a queue, and I forgot to go back. The place was heaving. It seems there were several retreats going on, and all the hotels were full. I found my guesthouse and booked in. The bad news was that Martyrs Bay guesthouse had never heard of me, despite me having a confirmation from the booking website. The good news was that they had a spare room, so it all worked out fine. I dumped the rucksack and headed out into the late summer sunshine. Actually, it was the last day of summer. I visited the ruined nunnery on my way to the abbey. and then the old church next to the abbey. This graveyard was in use by the Viking kings of ancient Briton before the moors invaded the Iberian peninsula. In fact, the Koran hadn’t even been written when this abbey was founded. A sobering thought. More recently, labour leader John smith was buried here in the 1990’s after he died. I couldn’t find his tombstone, but since I don’t really know who he was, I didn’t search too hard. It cost £8,10 to enter the abbey, which now belongs to the Scottish national trust. Why the 10 pence? Just being awkward on the change situation I assume. There were lots of old, fat and crippled people, mainly yanks, mostly all three, wandering around. The lonely planet guide warns that it gets a bit busy during the day, and says you have stay overnight to get a feel for the place. It felt a bit like Lourdes, despite not having fame for being a curative place. 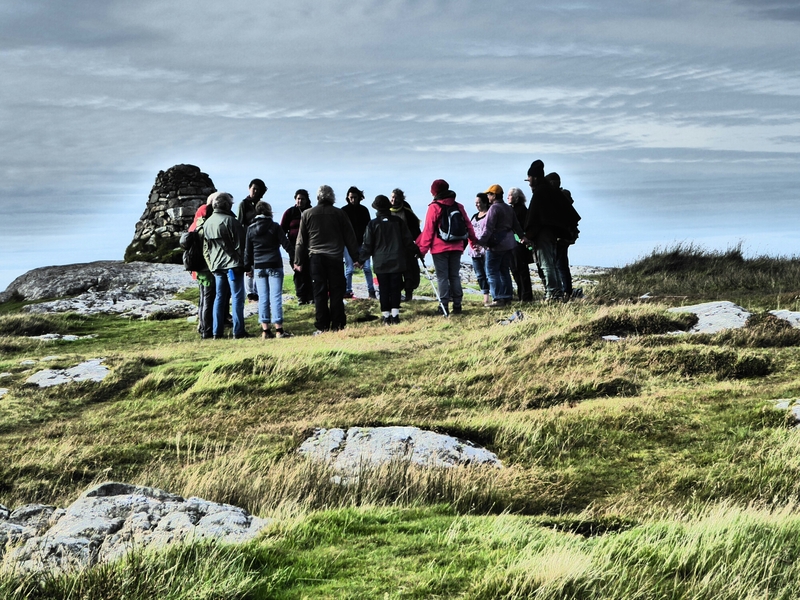 But some gullible people believe the island sits on a crack between our world and the next, a belief reinforced by the chirpy noticeboards scattered around which muse on such matters in the hope of lulling the tourist into a spending frame of mood. That reminds me of my Lourdes joke. A man in a wheelchair goes to Lourdes for healing. As his friends pray for him, he takes a deep breath and surges across the healing pool in his wheelchair. As he rolls out, he feels no different. But later on in the pub, somebody points out that his wheelchair now has four new tires…. The abbey is actually still in use. A ministry in the 1950’s reopened it as a place for young Christians to examine the world in a new light, or some such thing. So bits of it are off limits. There are quite a few residents there at any one time, studying and praying and generally keeping themselves out of mischief. I wandered into one room, which was also being used as a conference room. Much nonsense scattered around, such as a whiteboard asking ‘how can non traditional African Christian communities use prayer to reorientate their channels of food productivity? – discuss’ and a steel Christian tree with prayers written on it, with a notice saying ‘as this tree sets down roots so do our prayers grow in love’. Guys, it’s not a real tree. A notice on the door sternly told me to close the door, otherwise I would be expected to clean up the cat mess if puss got in. The only time I came across any of the residents was in the main chapel, where another fresh faced young man tried give me a CND sticker from an information booth there. I pretended not to speak English and gave it back. Well, he can reuse it. Still, it was an interesting trip round. A decent if cramped little museum is on-site, and I learnt a lot about the history of Gaelic crosses. I especially liked the little hummock in front of the abbey, where Columba was said to have built a writing hut. Nothing there now but a small depression and a foundation for a standing cross. But I liked to think of the old chap, his hands still stained with blood, desperately writing his manuscripts there to absolve his sins. St C was supposed to have left Ireland after starting a war in which 3000 soldiers died, all because he stole a book and refused to return it. He was so racked with guilt that he sailed until he could no longer see his home island and dedicated his life to books. He didn’t go that far, although I suppose it was far enough in a 550 era coracle. A group of about 15 people holding hands, chanting and praying. They’d rudely occupied the very highest spot, so I sat down a little way off to survey the island, trying to ignore them. Everyone someone finished a prayer, their leader would call for a new suggestion. ‘may Jeremy win the election contact!’ or whatever would be shouted out, and off they’d go, praying for Jeremy. Followed by loud tuneless chanting, Buddhist style. It was quite irritating. After helping a solitary lady by taking some photos of her, I wandered round the back of the group just below their plateau. 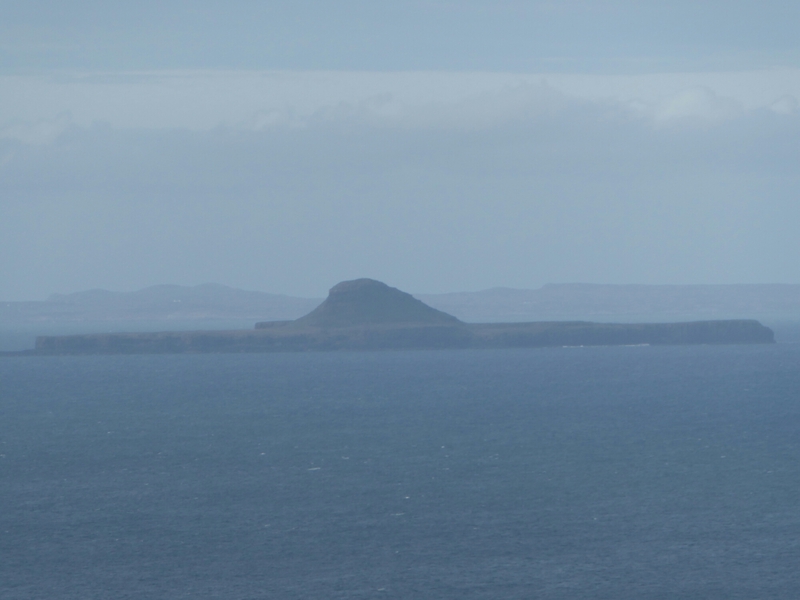 A strange hat shaped island sat offshore. As I stood there at the edge of the cliff daydreaming about sailing out to the island, I was nearly knocked clean off it when the leader of that pack of folks produced a seashell and blew through it, producing a god awful sound that sounded like a cow in labour. I was not best pleased, and stomped off. I was even less pleased when I waded into a boggy patch and had to retrace my steps, all the time accompanied by that lowing sound as he blew the conch shell at every compass point. Half way down the hill I came across a group of five middle aged women kneeling in the grass, looking out to sea, clasping crucifixes in their hands and praying. I left the sacred mountain and went off to the beach on the north end of the island. Along the way I passed a number of counter culture adherents -hippies if you will-, mainly bearfoot, wandering around happily. They all seemed very jolly people, wishing everyone happy days and whatnot. 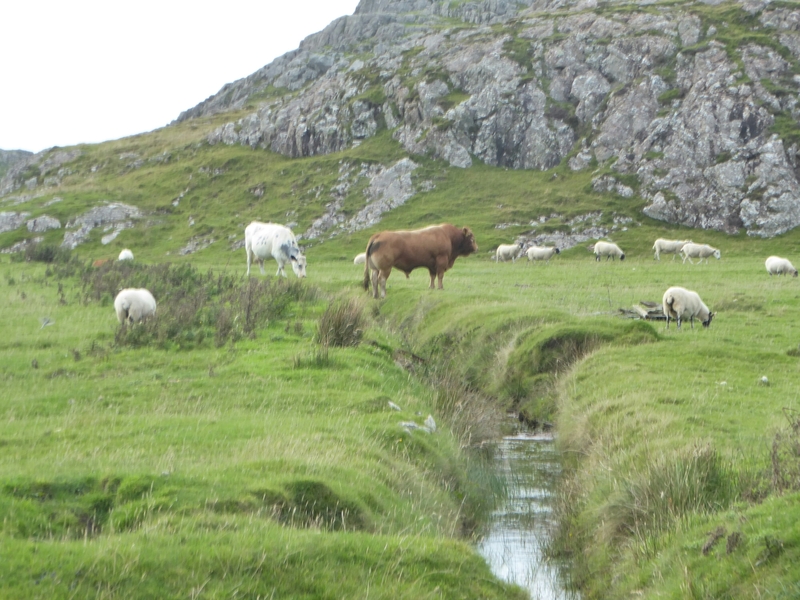 I also passed a stern looking island farmer, who was shooing his sheep back into a pen. The north beaches were lovely, and more importantly, fervent Christian free. Having come up the east coast, I wandered off to my left with the vague idea of wandering around the island. Of course, this was not as simple as you’d think. For a start, no path. For another reason, some fool had decided to partition the island with barbed wire fencing. I stared at the OS map on my phone, and worked out a route. Having come this far, I didn’t want to abandon the route and so hoped the first fence. Here’s a Scottish tip, which I learnt last time I was out here. Never follow a fence. They’re always boggy. Strike away from them. Even if there isn’t a path. It was wonderful. Bogs, cliffs, gravel beaches, sea birds, the lot. Even a bull. iSkirted around the bull. Live and let live, that’s my motto when it comes to large animals. He didn’t seem that interested in me. It was fortunate that I found a decent walking stick amongst the drift wood on one of the beaches. It was very hard going, and I had to pole jump a couple of barbed wire fences along the way. We shall skip over the walk. The bogs, the back tracks, the dead ends. Eventually I struggled back into civilisation, namely the island golf course behind the farm. I think I can safely say I’m the first person for quite some time to walk round the north half of the island, and I’ll wear that badge with pride. As I walked back in the late afternoon to the guesthouse, I noticed a sheep dog rounding up one of the small herds of sheep. A magnificent sight. Everyone on the island seems to have a small herds of sheep. I’ve never met sheep more uninterested in humans, neither scared nor curious. But they didn’t half move for that sheepdog. 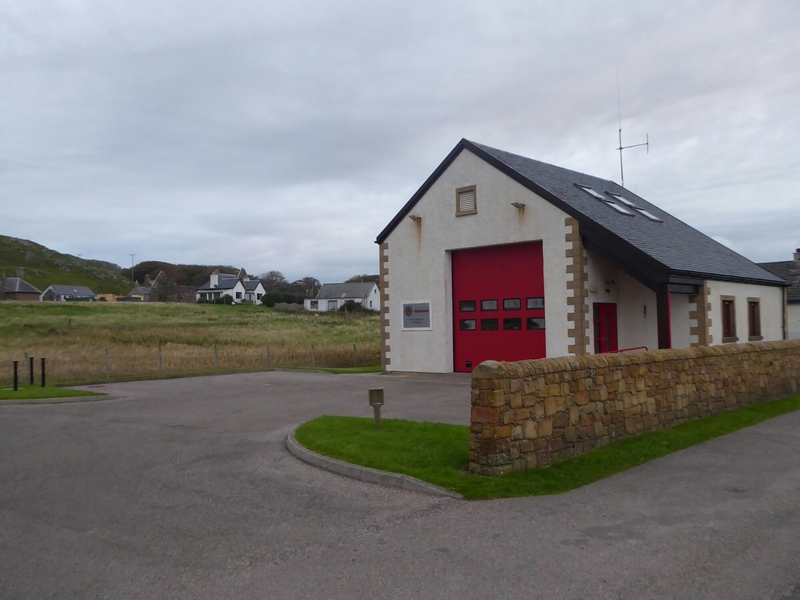 Now, how come every little community in Scotland has a local firehouse, whereas in Spain they are few and far between? A place like bedar would kill for a fire house like that, but no can do. Thought for another blog post in the future, along with the excellent tourist signposting here compared with Spain. I changed and went for a rather expensive yet average meal. Still, the views over the channel were superb. Place was packed, as they all were. As I emerged into the night, I was surprised to find it wasn’t that cold. Stormy, yes, but with a clear sky and scudding clouds. I walked along to the jetty, where Iona’s only three streetlights are. The tide was up, and big waves were smashing against the jetty, throwing water over them. Storm was coming…. I went for a brief walk in the moonlight. I went via the nunnery to the old church, where, surprise surprise, a couple were praying. I didn’t want to disturb them. Walking around in the dark, i kept coming across groups of abbey residents also walking, each with a little electric torch. I then was overcome with a naughty urge. I jumped the wall into the abbey and darted across the lawns, avoiding the electric torches, to St Columba’s hill. I scampered up the side and hid in the sheltered hollow at the top. There, I lay back in perfect contemplation and steared at the clouds shooting along in front of the stars. It could have been 1500 years ago, with St C himself looking over me. A mystical experience though the address, from one writer to another. For a minute, I too started to believe that Iona was truly on a line between this world and another. Couldn’t last, of course. A few minutes later, at 8:45 precisely, the bells of the abbey rang out thrice times seven. Scared the hell out of me, I thought they’d spotted me and were ringing the alarm for a second. They weren’t, of course. Instead, from all over the island little electric torches started up and came flooding back in. Dozens of the damn things, it was quite eerie. At the same time, a car started driving up and down the only road. No idea what it was doing, but it was driving around for ages. Eventually I scampered out of the grounds, avoiding a few torches that were still wandering around. Was that a shout in the wind as I pole vaulted over the stone wall? I doubled back though the church yard and took refuge inside the church, where some candles were still burning. After ensuring that the coast was clear I went back to the guest house. Where I slept like a log, lulled by the sounds of the breakers roaring against the beach across from my window. 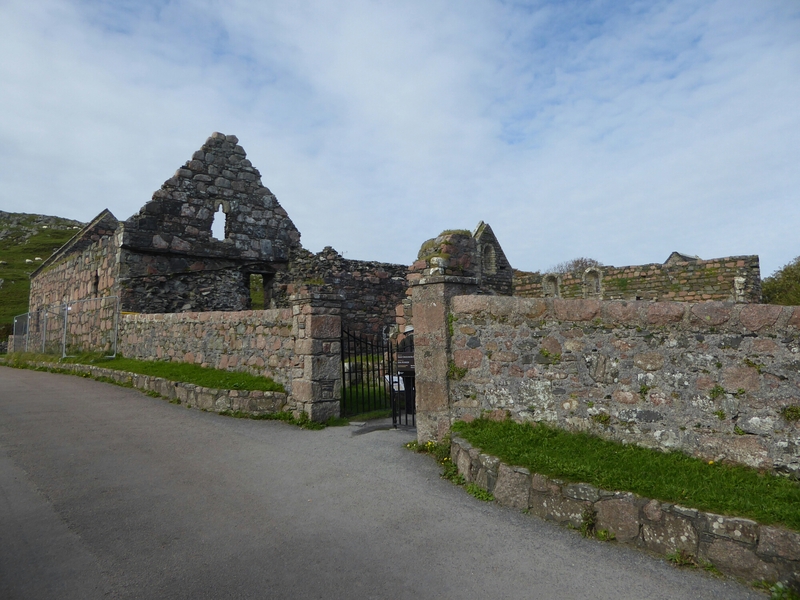 This entry was posted in 14 days in the Hebrides and tagged abbey, church, columba, Iona, ireland, Mull, religion by David. Bookmark the permalink.